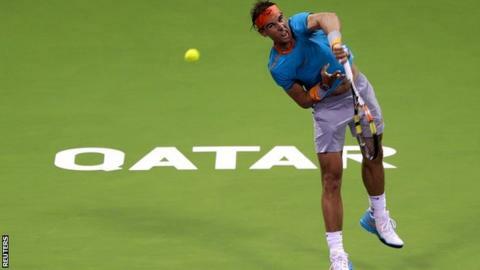 World number three Rafael Nadal made the worst possible start to the new season as he lost to Germany's Michael Berrer in round one of the Qatar Open. The Spaniard could not build on a strong start and Berrer, ranked 127th, powered through to win 1-6 6-3 6-4. Nadal, 28, played only seven matches between Wimbledon and the end of last season as he struggled first with a wrist injury and then appendicitis. Top seed Novak Djokovic earlier beat fellow Serb Dusan Lajovic 6-2 6-1. Berrer, 34, had to come through three rounds of qualifying in Doha and had only two wins over top-10 opponents to his name before Tuesday. Nadal, the defending champion, fought until the end and earned two chances to break back when Berrer served for the match, but the German held his nerve superbly to come through after just under two hours. "These things happen after a long time without being on the road, being on rhythm, being in competition," said Nadal. "I was playing with more nerves because after a long time away I wanted to win. "My motivation and my hunger to keep doing things well is still the same." Berrer, who is set to retire from the game at the end of 2015, said: "It's really unbelievable. It's my last season so I'm just going for it. Why not?" Djokovic pulled out of the Abu Dhabi exhibition final last week with flu, but said he was pleased with his performance "under the circumstances that I was in for the last couple of days".